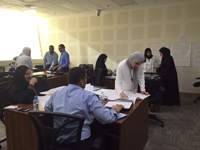 Faculty of Pharmacy innovates and wins a prize! During the Kuwait International Medical Education Conference held on Feb 14 to 17, the Assessment Committee at Faculty of Pharmacy, including Prof. Pierre Moreau, Dr. Ahmed El-Hashim, Dr. Dalal Al-Taweel, Dr. Maryam Alowayesh and Dr, Tania Bayoud, were invited to present their unique and innovative proposal about the development of an assessment framework for a competency-based curriculum in pharmacy education. 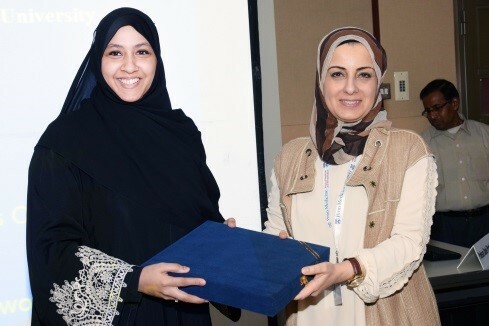 Dr. Maryam Alowayesh, who presented this work, was commended by the international experts in this field for the innovative and courageous step taken in tackling this matter. The Faculty of Pharmacy was thus recognized as a pioneer and a leader in evolving education in healthcare. Pharmacist Shaimaa Abdelmeguid were awarded a Master degree (MSc in Diabetes Care, Education and Management) from University of Dundee, Scotland. Dr Abdemoneim Awad (Dept. 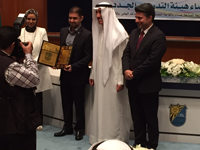 of Pharmacy Practice) has received an award from Kuwait University Faculty Association in recognition of his research activity. Dr Maitham Khajah (Dept. 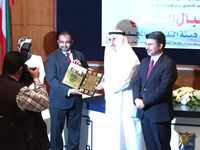 of Pharmacology and Therapeutics) has received an award from Kuwait University Faculty Association in recognition of his research activity. Dr. Ahmed El-Hashim (Dept. of Pharmacology and Therapeutics) has been granted a patent by the United States Patent and Trade office for the discovery of novel anti-tussive and bronchodilator actions for the Enaminone ester E121. Pharmacist Asmaa Al-Haqan was awarded a Master degree (MSc in Diabetes Care, Education and Management) from University of Dundee, Scotland. 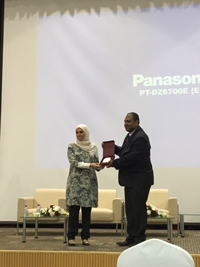 Randa Abdel-Salam (Chief Technician) has been awarded a PhD degree in Biochemistry from Ain Shams University, Egypt. Prof Eric Driessen, a specialist in assessment, from the University of Maastricht, visited the faculty of Pharmacy In October 2015 as a consultant to help in the development of a programmatic assessment frame work for both the add-and entry level PharmD program.